There’s actually a lot to choose from, and that’s no slight on the designer or his creation. Only in the fullness of time and experience, as well as countless more playtesters than he ever had at its inception, did many of these come to light. The “one-mana threes,” for instance, seemed like a good idea at the time, a nice and tidy cycle of cards for each colour. Of course, looking at them taken together- Giant Growth, Lightning Bolt, Healing Salve, Dark Ritual, and- wait for it- Ancestral Recall, it paints a very different picture now. And a zero-casting-cost artifact that gives three mana of any one colour? Maybe not such a good idea, even if it became one of the game’s enduring icons. Rather than highlight single cards that snuck past developmental fine-tuning, however, today we’ll be looking at an entire spectrum of cards that Wizards has spent successive years trying to fix: the aura. Over the course of the game’s history, this has resulted in a number of different approaches. The first, and perhaps most obvious approach is to make the aura so good that it’s simply worth the risk. Alternately, you could have it return to hand and be able to be recast if the creature it’s placed on dies. Rancor is a popular example of the latter, and Angelic Destiny combines them both. Other ways might be to make the aura a cantrip, such as with Alliance’s Bestial Fury. You could give it a spell-like effect when it’s cast, such as Flight of Fancy, or make it castable at instant speed as with Cho-Manno’s Blessing. When Mirrodin came along in 2003, Wizards introduced a new type of artifact called Equipment. These were designed to act much as auras did, but without the inherent weakness of the card type. Magic had long played in this space before, such as with Ashnod’s Battle Gear, but the ability to equip something was new ground. For weenie/swarm decks, this new type of artifact gave them an added level of durability into the midgame, where their creatures tended to begin getting outclassed. By pumping them up, their usefulness could be prolonged- and when the bearer inevitably perished, the artifact could simply be thrust into the hand of the next one. Equipment turns in a feature performance in today’s deck, the aptly-named Weapons of the Warrior. 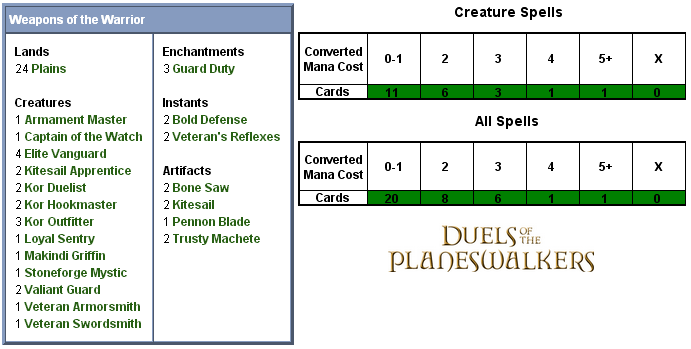 The deck has one of the most aggressive starts seen yet in Duels of the Planeswalkers, consisting of eleven one-drops. The stalwart Elite Vanguard makes an appearance here, with a full playset of these staple 2/1’s that in a former life were the rare Savannah Lions. A pair of Kor Duelists from Zendikar also give us the first indication of the deck’s theme support, with cards that not only welcome equipment but actually improve just by carrying some. As every piece of the deck’s seven equipment provide a power boost, there’s a fair amount of mileage to be gained from the double strike on offer here. Cut from similar cloth is the Kitesail Apprentice. From Worldwake, these become 2/2 fliers whenever they get equipped. Moving on to a pair of Valiant Guards, we find the deck’s first discordant note. White Weenie is a deck strategy that relies on speed to overwhelm its opponent before they have a chance to set up, and while a first-turn 0/3 is a great play for decks that need time to set up, Weapons of the Warrior’s core strategy is only hampered by their presence. In fairness, there are ways to improve their power in the deck, but wouldn’t you rather start with something that can attack on turn 2 unaided? By the same token, the Loyal Sentry is a curious choice. Though it indeed can get in for damage, its triggered ability clearly makes it serve the role of a defensive tripwire. Originally printed in Starter 1999, these were picked up for reprinting in Tenth Edition before seeing a third release in Duel Decks: Elspeth vs Tezzeret. Moving on to the deck’s two-drops, we find two more rares in the Armament Master and Stoneforge Mystic. The Armament Master, which served as the foil rare in Zendikar’s Kor Armory, is brutal here. Another unassuming card that gets much stronger whenever equipped, the Master gives a +2/+2 bonus to all of your Kor. With the Kor making up around half the deck, that’s a substantial benefit. The Mystic, on the other hand, has a much more storied pedigree, including being banned in the Standard of its day. Indeed, such is her power that she’s even banned in Modern. Here, with a less optimised shell, she simply tutors up one of your generally solid but unflashy artifacts- and giving you a ‘discount’ on only one of them. Next up is the Kor Outfitter, a 2/2 that gets a free equip when it enters the battlefield. This can save you anywhere between one and four mana, so it’s not inconsequential even if it’s the only trick this Soldier has. 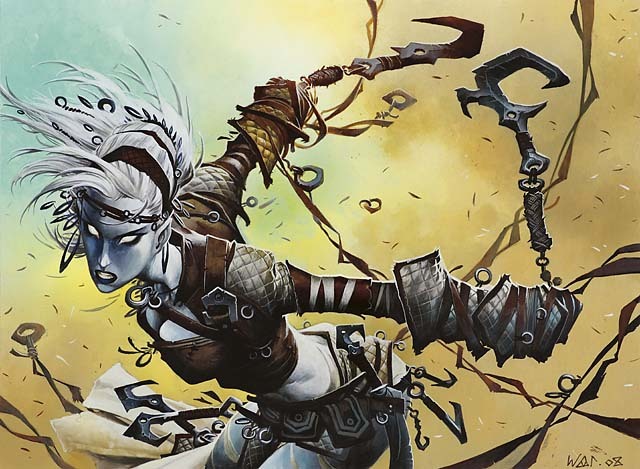 Finally, there’s one copy of Magic 2010’s Veteran Armorsmith. A tribal version of Ravnica’s Veteran Armorer, the Armorsmith is one half of a two-card pairing with the deck’s first three-drop, the Veteran Swordsmith. Each of these is, in essence, ‘half a lord,’ giving either a power or toughness boost. That’s not their only intriguing symmetry, with one being a 2/3 and the other a 3/2, and their casting costs- although different on the face of it- have a certain alignment as well (with two colourless mana being the typical equivalent of a single coloured mana, as evidenced by Polluted Mire and Barren Moor). A pair of Kor Hookmasters round out the three-drops. In stark contrast to the Valiant Guards, these are exactly the sort of cards this deck wants. By offering a tempo advantage over an opponent while locking down their best defender, this is another route to keep Weenies relevant as the match transitions to the midgame. You only get two here, so use them wisely. There’s only one four-drop on offer here, the relatively pedestrian Makindi Griffin. 2 power in the air for four mana in White isn’t all that great, and while the 4 toughness gives it some durability, this is another card that’s not the best fit here. For a top-of-curve bomb, though, you could do worse than Captain of the Watch. Almost every creature in the deck is a Soldier, able to benefit from the +1/+1 bonus. In addition, she brings a trio of tokens to the table alongside her, essentially giving you 9 power for 6 mana. She’s not cheap, but that’s a solid deal, and a fine inclusion as a singleton closer. The noncreature support suite for Weapons of the Warrior is straightforward and workmanlike, comprised exclusively of equipment, combat tricks, and removal. For the former, you get two copies each of the Trusty Machete, Kitesail, and- in a rare diversion from Zendikar block- Conflux’s Bone Saw. Each of these are cheap to play and cheap to equip, relying on the inherent abilities of creatures like the Kor Duelist to make them even stronger. A little more expensive is the miser’s copy of Pennon Blade, from Rise of the Eldrazi. The Blade gives a much more substantial bonus, well-suited for a deck with access to a lot of creatures. The combat tricks are small in number- only two copies of two different cards- but it’s just enough to keep an opponent on their toes. Veteran’s Reflexes is as good a trick as you’ll find here, dirt cheap and letting you use assets already committed to attacking your opponent. The power and toughness boost is modest, but the price strikes the right balance between power and utility. Bold Defense, meanwhile, is considerably more expensive- three mana unkicked, seven if you pay for the full effect- but it has two advantages. First, it affects your entire side, making it useful for finishing off a crippled opponent. Second, kicker’s flexibility gives you two useful effects depending on where you are in the game. Sadly, the deck is most let down by its removal package which is dreadful- three copies of Guard Duty. To understand the niche application of Guard Duty, one has to understand the environment of Rise of the Eldrazi. The term used to describe that environment was “battlecruiser Magic,” where you spend much of the game assembling the resource base to unload on one giant Eldrazi-sized purchase. To make this feasible, though, removal had to be restricted- what’s the point in building up a swarm of Eldrazi Spawn Tokens, cashing them in to field an Ulamog’s Crusher, only to see it draw a two-mana Pacifism. Wizards was very careful about what removal made it into the set, and there was typically a catch. Vendetta could happily snuff out an Eldrazi menace, but at a horrific cost in life. Heat Ray, meanwhile, could kill anything, but it took more mana to kill an Eldrazi as it did to cast one. And then there’s Guard Duty. Could this stop an Eldrazi in its tracks, preventing you from being subject to the annihilate mechanic? Absolutely- but the trade-off there, of course, is that you now have to contend with a massive defensive option still happy to serve your opponent. The other thing to consider is that as a White Weenie/swarm pilot, your life total is one of your greatest assets to bait your opponent into attacking. Such decks are delighted to trade out life in exchange for a weakening of an opponent’s defenses, and so removing the ability to attack doesn’t do much to keep the red zone attack lane clear. This is a misplay for this deck, and as always it’s difficult to discern whether this was poor construction or deliberate balance. There’s just too much in this deck that undercuts what White Weenie wants to be doing and having Guard Duty as your only pinpoint removal option is awful. Overall, though, we’ll need to take it into the field before rendering final judgment. We’ll put it through its paces and return with the verdict in two days.